A young humpback whale that appeared in Dunstaffnage Bay near Oban has moved out to deeper water. There were concerns for the animal after it became stuck in shallow water between a pontoon and a Scottish Association for Marine Science lab. The whale managed to free itself from that position before leaving the bay. 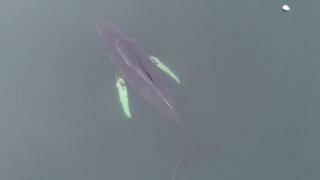 Scottish Association for Marine Science (SAMS) staff have been monitoring the whale using a drone. Humpbacks are a deep diving species of whale. The animal was estimated to be about 7.6m (25ft) long. Oban, Appin and Inveraray Coastguard Rescue Teams, Police Scotland, Scottish Fire and Rescue Service, British Diver Marine Life Rescue and Oban RNLI were on standby to help the whale.